Rescue of a submarine crew. In my book “Tale’s from my Grandmother’s Pipe” I have already written about a unique sea saga involving Captain Ernest Alfred Johnson of Saba. This took place just after World War 1. Captain Freddie was born on Saba on Sunday June 15th, 1884. His father was William James Johnson and his mother was Judith Eleanor Dowling. In 1906 he married Mary Ellen Hassell whose parents were Abram Thomas Hassell and Mary Ellen Darsey. He lost his father at a young age. His brother John William Johnson “Sonny” told me that he and his father had gone fishing in the cliffs in a place known as the “Vipers Hole” also known as “Wiba Hole”. His father slipped on a rock and the ensuing fall crushed his head on the rocks below. Sonny was a little boy and he scrambled up the cliffs to “Booby Hill” where they lived to bring the sad news. It took hours before a boat could get around the island to retrieve the body. Captain Freddie went to sea early on as a teenager. When he was old and lived in his home on Booby Hill which he built in 1906 with lumber brought on a Saba schooner from New York he became a celebrity of sorts. Dr. Goslinga who was Inspector of Education at the time interviewed him and put together a manuscript called “21 knot Johnson”. Years later the famous Antillean author, recently deceased, Dr. Frank Martinus Arion fell in love with the manuscript and wanted to publish it. He even came to Saba and made a presentation in the Youth Center in The Bottom and made a plea for the manuscript to be published. But it came to nothing. Captain Johnson had an eventful career. He even owned a large four master schooner the “T.N. Barnsdell”. Capt. E.A. Johnson’s four master schooner the T.N. Barnsdell . William son of his brother William (a.ka. Buck) was a Commander of a large battle ship during the Vietnam War. The most remarkable event of Captain Freddie’s career though was the rescue of the crew of the submarine S. 5. During the month of August 1920, the “S.S. Alanthus”, under the command of Captain Freddie, and the S -5 submarine, 231 feet in length were in Boston harbor. At the time the S-5 was the largest submarine in the United States Navy. As the dawn of that fateful morning broke, the submarine started on her journey to Baltimore. While she was closing in on Delaware’s Cape Henlopen in 170 feet of water, her commander Cooke, decided to dive. The S-5 began to descend to the dark waters below. Slowly she went down to 50 feet, and at 60 feet she tried to level off but was unable to do so. She continued to plunge in the dark depths. An air induction valve, which had been opened, was unable to close. My. uncle Capt. Charles Reuben Simmons served once as a mate on his schooner the Barnsdell. Uncle Reuben said he was a very strong man. In a recent article in Undersea Warfare, the Official Magazine of the U.S. Submarine Force, found by my son Chris on the Internet, additional information was revealed on this historic incident. “Somewhat after 1900 hours, several men who had found refuge in the motor room – now the top most compartment – reported a startling observation: the sound of waves beating against the hull! The truth dawned: Given S-5, s length, the depth of water where she was marooned, and the angle she made with the horizontal, 20 feet of the boat’s stem was protruding above the surface! However, the after escape hatch was still 30 feet below water, and even if the boat were completely vertical, the hatch would barely break the surface. Cooke immediately realized that there was only one final possibility – to cut their way out. The village of Booby Hill where Capt. Johnson was born and lived his last years. Abaft the motor room was one very small compartment – the tiller room- where the rudder post and steering gear were located. Around 2000 hours, Savvy Cooke made his way upward from the control room, and with several crew members and a manual breast drill, entered the tiller room for an attempt to bore through the three-quarter inch, high-strength steel that separated them from the outside world. Despite the cramped conditions and awkward angle of attack, the men had succeeded within twenty minutes in drilling a quarter inch hole through the hull, which revealed that indeed the stem was well out of water and – not surprisingly – that night had fallen. With only a selection of drills and miscellaneous hand tools to work with, Cooke decided to proceed by drilling a circle of closely-spaced holes and employing a hammer and chisel to knock out the intervening metal. With perseverance, this would eventually result in a large enough opening for a man to wriggle through, but considering how long it had taken to drill the first hole, it would likely take over three days to finish the job. Nonetheless, Cooke organized the crew into working parties to take on the back-breaking task, and the drilling began in earnest within an hour. The crew kept at it all night long, and by sunrise in the morning of Thursday, 2 September, had opened up a slot through which they could scan much of the horizon in the gathering dawn. Two ships appeared, too far away to be of any help. Meanwhile, the atmosphere inside the boat was becoming increasingly foul, and the effects of oxygen-deprivation and carbon dioxide asphyxiation were worsening rapidly. The men panted for breath and could barely summon the energy needed to climb up into the stern and take their turns drilling on the hull. Moreover, as air escaped through the widening hole, the decreasing internal pressure allowed more water to leak into the hull, and the boat began slowly sinking back toward the bottom. The crew’s race against time accelerated. Capt. Johnson was a celebrity and people coming in from off-island were always visiting his home and taking his photograph. By 1400 Thursday afternoon, 24 hours after S-5 nosed into the bottom, Cooke and his drilling teams had only achieved a triangular hole six by eight inches, and most of his men were either incapacitated or unconscious from lack of oxygen. Then, when all seemed lost, another ship appeared, much closer than the first two, and Savvy and his men searched frantically for a way to attract attention. Ultimately, they found a ten foot copper pipe, fastened a sailor’s tee-shirt to it, thrust it out through the hole in the hull and waved desperately for help. The ship was a small coastal steamer, SS Alanthus, bound from New York to Newport News under the command of Ernest A. Johnson, a veteran merchant mariner. Although Alanthus was actually moving away from S-5 at the time, by an extraordinary stroke of luck, a man on deck glimpsed the distant outline of the submarine’s stem and its fluttering white flag. Alanthus immediately came around to investigate. Capt. Ernest A. Johnson in front of his home which he built in 1906. Johnson brought Alanthus as close to the hulk as he dared and had himself rowed over in a small boat to the submarine’s protruding stem. After a shouted exchange with Savvy Cooke, Johnson immediately recognized the urgency of the situation and the need to act quickly. He returned to his ship, maneuvered her against the submarine, and tethered S-5’s stern to Alanthus with a manila hawser, chain slings, and cables. Next, he ordered a wooden platform erected to give working access to the submarine’s stem, and his engineers improvised an air pump to replenish the atmosphere in the stricken boat. With some of the immediate danger relieved, Captain Johnson then turned to the problem of getting Cooke and his men out of the submarine. Johnson had left Alanthus’s radio operator in New York, so he had no way to call for help. Moreover, he had no drills or cutting tools onboard, so to continue enlarging the escape hole, his men under Chief Engineer Carl Jakobsen had to depend on using the S-5’s own badly worn equipment, passed out through the small opening. By 1700, Jakobsen’s crew had resumed drilling from outside the hull, but progress was agonizingly slow. Luckily, at about the same time, another, much larger ship appeared on the horizon a 4,800-ton passenger steamer, the SS General George W. Goethals, and Johnson succeeded in attracting her attention with an emergency flag hoist. Goethals’ Master, Captain E.O. Swinson, brought his ship to the scene and anchored nearby. Fortunately, Goethals was considerably better equipped than Alanthus, and was able to radio the Navy for assistance. All up and down the eastern seaboard from Philadelphia, Norfolk, New York, and New London, Navy ships prepared to cast off and head for the scene. Another view of Capt. Johnson during a heavy dry weather as you can see. Swinson sent his Chief Engineer, William Grace, and the latter’s first assistant Richard McWilliams, to help with the drilling, and they brought a manual ratchet drill that proved much better suited to the task. Since S-5’s crew was still in considerable danger, and the first Navy rescuers wouldn’t arrive until 0400 Friday morning, the two merchant captains agreed to continue with their own effort, and Grace and McWilliams took over the drilling shortly after 1900. The two engineers attacked the job with a will and Grace – a large powerful man was able to drill a new hole every four or five minutes. By midnight, they had completed an 18 inch circle of holes, and an hour later having chiseled out the remaining metal, drove in the resulting chunk of hull plating with a sledge hammer. After nearly 36 hours trapped in the disabled boat, S-5’s crew was free! The men made their way out one by one and were ferried to an improvised infirmary in Alanthus’s galley, where two doctors from Goethals provided emergency treatment. Because of the debilitated condition of the crew and the need for each of them to climb much of the length of the submarine to get out, evacuating the 40 men was a difficult and laborious process, only completed after 0330, just as the first Navy ships began to arrive. Savvy Cooke, awake for nearly two days, was last to leave his command. Capt. Johnson being visited by old friends from Saba who lived in the United States. To the left Joe Johnson and to the right Emile Johnson. The last of over a half-dozen Navy ships to reach the scene in the early morning of Friday, 3 September was the battleship USS Ohio (BB-12), which appeared at 0900. By then, Goethals had already left the scene, and Cooke and most of his men were asleep but recovering quickly onboard Alanthus. The small freighter was asked to make a first attempt to salvage the submarine by towing her to shallow water nearer land, but the task was too much for her limited power. Thus, after S-5 was made fast to Ohio and the rescued crew transferred, Alanthus left for Newport News to the cheers of the fleet. Late in the afternoon, Ohio herself attempted to tow the submarine nearer to shore, but after several hours with Ohio at full power and S-5 apparently dragging along the bottom, the towing cable parted. At that time, only four miles had been made good toward land, and operations to save the boat were suspended. A nice view of Booby Hill in 1964. Photo by Father Boradori. Village where Capt. Freddie was born and after a life of adventures at sea he returned to and is buried there. Although the Navy gave up their attempt to salvage S-5 in 1921, her hulk was rediscovered in 1989 by civilian sport divers 48 miles southeast of Cape May, New Jersey, and it remains a challenging dive site today. The circle of plating cut labourisly from S-5’s hull to allow Cooke and his men to escape was preserved and may be seen today in the Navy Museum at the Washington, DC, Navy Yard. It is approximately two feet in diameter and 3/4ths inch thick. Subsequently, the Secretary of the Navy rewarded Captains Johnson and Swinson, and engineers Jakobsen, Grace and McWilliams for their part in the rescue. Captain Freddie lived on with his memories at his home on Booby Hill and is buried in a private cemetery above his house on Bobby Hill together with his beloved wife. That his memory should not be forgotten we record this heroic story for posterity!! My first official Holy Communion. Photo Jeremiah Leerdam. A friend from St. Martin recently expressed her amazement as to how many photographs there are of Saba people. At the same time she said that there is nothing like that of the people of St. Martin. It would be nice to have something similar as Saba has of those Of Saban Descent. So I thought I should record for the future a bit of history of photography as well as those from Saba and elsewhere who in photos have recorded the people and the changing scenes on Saba since photography was invented. After 1860 when photography was new and complicated still, several entrepreneurs seeing a novelty for postcards traveled the islands in search of photographs to turn into postcards. At the same time while on island they would get extra business by people wanting to have photographs made of their families. At least those families who could afford that. And there were not many back then. So many of the photographs from before nineteen hundred are either scenes of the islands or of the more wealthy class of people. This photograph of part of Windward Side known as “Under-the-Hill” is the earliest photograph of the island which I have found. It predates the Anglican Church built in 1877 and the photo is taken about 1875 or slightly before. Some people today might think that photography always existed. There are so many world class cameras today and not to mention cell phones which can also take quality photographs so easily that no wonder people believe it was always this easy. Just for your information here is a photography time line. 1841 Mr. Jeremiah Leerdam (left) and Mr. Clement Sorton , here on patrol in front of the old police station in The Bottom. As far as I can remember the first photographer I knew was the police officer Jeremiah Leerdam . He was born on Saba on Tuesday June 20th, 1911 and died in a tragic accident on St. Maarten coming over the hill in a Police Jeep. He was married to Amy Alextia Hassell of Windward side. His full name was Jeremiah Worboeff Launcelot Leerdam and his mother was Adelay Donker. His father was Jeremiah Worboeff Leerdam of St. Eustatius. Jeremiah’s father had served in the Dutch Navy in the Dutch East Indies (Indonesia) for many years. Before marrying at the age of 54 he had children by Adelay Donker such as the late Mr. David Lionel Henry Donker and he also had left a son behind in Indonesia. Somehow our Jermiah in this article had developed a love of photography from an early age. As a small boy I can remember him in his police uniform or without it travelling through the villages on Saba taking photographs. His nephew the Honorable Mr. Max Nicholson told me that he had a box of his photographs in the ceiling of his home but with the loss of his roof in hurricane George in 1999 everything in his ceiling was destroyed including his uncle’s photographs. I still hope that someone in his family will have some of the photographs he took. I have one which is posted with this article. He took me on the day of my official first Holy Communion on the steps of the home of the legendary Josephus Lambert Hassell, the man who built the road which could not be built. I say official because on my birthday a year before the priest had given me communion by mistake. I was an altar boy and my teacher Miss Una Johnson who also shared a birthday with me declared it a miracle, and what a too do over that incident. Also the shoes I have on were borrowed from a neighbor whose son was scheduled for first communion a few weeks later. Under instructions to be extremely careful not to soil the shoes I fell on my way to church. Saba’s first real local photographer Jeremiah Leerdam. He had a passion for it. After Jeremiah there were a number of locals who tried their hand at photography, mostly for fun and a few tried it commercially for passport photos, weddings, funerals and so on. My brother Freddie when he lived on St. Martin studying for teacher. I want to recall here my brother Walter Frederick Martinus Johnson better known as “Mijnheer” or teacher Freddie. Went to school on St. Martin and after that taught in Bernard College in San Nicolas Aruba for five years and then returned to Saba in 1956 to teach. He was always proud that he had been a teacher for more than thirty years before the class. His family has his collection of photo’s he took over the years and there should be many. Eugenius Johnson seated here with my brother Eric. Eugenius Achilles Johnson, Government official and Administrator and Lions Governor also took a number of photos especially of activities of the Lions Club members and their many functions here on Saba and abroad. His collection is kept by the Lions Club of Saba. An effort should be made to have these collections copied. Raymond Simmons on his recent visit to the island went around scanning as many photos and slides as he could. The teacher Thomas Frank Hassell also took photos and was quite a collector of photographs of all three Dutch Windward Islands. I have a number of his collection and cherish them very much. I was Act. Lt. Governor when I handed over a Royal Distinction to Mr. Frank in the presence of family and friends. The other photographer was Benjamin Ambrose Johnson. While he came into this world a midget and did not improve on his height during his lifetime he left this worldly existence a giant. When he passed away my brother Eric wrote an article on “Gilly” as he was known and highlighted the many things “Gilly” had tried in his lifetime, from keeping honeybees, to milk cows, pigs, and baking bread and having a bar, making hot pepper you name it and he tried his hand at it. He also took photos and printed his own photos and made postcards. Benjamin Ambrose “Gilly” Johnson here with teacher Ms. Gladys Hassell. The other one was Mr. Carl Mervin Hassell a government official who in his spare time did photography as a hobby and also if I remember correctly developed his own photos. I am sure that some of his photographs survive with members of his family. Mr. Carl Hassell pictured here in a booklet when a delegation of Saba people involved in arts and crafts held an exhibition on Aruba years ago. Also we cannot forget those who came here to teach and to do research. In the nineteen fifties from 1956 through 1958 the Public School teacher Mr. H.L. van Scheepen took many photos of Saba and its people. He told me that he was one of the few people with a camera on the island and the government kept calling on him to take photos of visiting dignitaries. He returned to Saba in 2013 to see former pupils and together with his son they took a large number of photos once again with better equipment than he had in the fifties. Teacher H.L. van Scheepen was a teacher at the Public School in The Bottom between 1956 and 1958. Another great contribution to the history of photography of Saba’s people was done by Dr. Julia Crane and who was assisted by some students who were helping her out. Her research for her two books “Educated to Emigrate” and “Saba Silhouettes” and her long stay on Saba in 1964 followed up by other visits gave her the opportunity to make many photos of people of Saba especially. And so thanks to her I have a couple of hundred photos which I regularly share on Facebook to the joy of the families of those who appear in these photos. There were also government photographers on Curacao and in Holland who traveled along with members of the Dutch Royal family. They too took a number of photos which are now in Dutch archives. One who comes to mind is Willem van der Pol who visited here in 1948 or so and took many nice photos of people. In his archive we find photos of many of the old time colorful characters in their day who are now long gone. I cannot forget Administrator Max Huith who was also an avid photographer and in the late nineteen forties would have many people assembled in large groups for a picture taking session at the home of the Administrator. Mr. Max Huith pictured here with his camera in Berkelo Holland where he retired being visited by his friend and photo enthusiast teacher Frank Hassell. I have tried my best to identify as many people as possible who made it possible to have so many photos of Saba available to the people of today. And now that everyone is a photographer thanks to the cell phones and modern camera’s people like Ms. Voltaire Simmons, niece of the well-known Jeremiah Leerdam have brought us full circle and there will be no lack of excellent photographs in future of events taking place on Saba in recent years. This information is from several extensive letters written by the Roman Catholic priest Father E, Onderwater. These letters were about the isolation and the story of the Priest Father Laurentius Mulder who served his churches on Saba living in absolute poverty, from 1882 until his death on August 3rd 1916. Father Laurentius Mulder as a young priest. The parish priest of St. Maarten, Father Engelbertus Onderwater, former Editor in Chief of the ‘Amgoe di Curacao’, decided to go and spend some days with his confrere Laurentius Mulder, the hermit of Saba. His story of the difficulties of travel back then and on arrival the still more difficult task of climbing up to The Bottom needs retelling as that experience has been unique to each traveler to Saba back then. Roman Catholic Priest on St. Martin. It was shortly after Easter and he wanted to deliver personally an Easter greeting. The journey would take place by boat which means an open tub with one mast and sometimes with half a mast only. Sometimes with no deck with only a hut in the front where the anchor was stored and which could be closed with a lid. There were no accommodations on board. No food was provided, you had to carry with you that which you wanted to eat, if you were so stubborn as to think that underway your stomach could retain any food. The duration of the voyage could not be calculated, it could be six hours, or twelve or even twenty four hours; you never knew that in advance. There was no place to lie down or to sleep. On the bottom of the sloop, around the foot of the mast, there was a pile of rocks and some pieces of rusty iron which served as a ballast. You could lie there if you wished. You could also not bother, it did not help anyway. There is no question of sleeping. You were only exhausted for free…-no, that is a mistake; you had to pay for it as well. This time it turned out to be very bad. It anchored at the Ladder bay, but just too late in the afternoon, at sunset. No Saban came down at that hour to take the passengers from on board with a porter boat to take you to shore. R.C. church in The Bottom with Father Mulder to the left. Nothing else to do but to remain floating until tomorrow morning? Deep despair took hold of the much tortured priest. But the helmsman started to whisper with the Captain. The latter nodded yes and shortly thereafter the priest saw the helmsman busy opening the front of his shirt. The cabin boy shortly thereafter took off everything he had on and splash, splash both of them went overboard, swimming as best as they could towards the shore of Saba. After a quarter of an hour both of them were on the beach, that’s if you want to call it a beach. It is a small piece of land, complete covered with large stones which have been given a round shape through the thousands of years rolling back and forth so that there are no sharp edges left. On the beach there were some row boats. The mate and the cabin boy selected one of them, the least leaky one, and pushed it into the water. After ten minutes they were alongside. Father Onderwater climbed over with his limited baggage and was rowed to the shore. Second R.C. church in The Bottom. Later turned into a school. There he stood; no house, not even a hut to be seen, not even a cave in which to seek shelter and the stars could already be seen in the skies. There was no choice left to him: to climb up was the only option. Where is the road? The road??? Oh, we do not have one here. You simply climb straight up against the cliffs, and you will reach automatically. The priest looked up in the darkness and only saw a high black mountain, threatening and inaccessible. His courage sank into his shoes. All of his limbs were paining from lying and being tossed around on the heap of stones by the mast; his stomach was empty; he had not eaten for nearly twenty four hours. And in that condition to climb 800 feet against the steep mountain wall without any moonlight! Under those circumstances you do not have to be a child to feel miserable and unhappy. But there was no other choice. Therefore he began to climb. Panting and groaning he worked himself slowly upwards; his stomach famished and screamed for a small meal. When he was perhaps 80 feet on the way, he looked back carefully to see if he was making any progress. There was already a whole chasm under him, deeper and terrifying made so by the heated imagination of the victim. His heart thumped in his throat. Would there ever come an end to this clamber? First R.C. Church on Saba. Built in 1860 in Windward Side. There he heard suddenly voices behind, or rather under him and shortly thereafter he saw the captain, accompanied by the mate and the cabin boy coming along and passed jolly alongside him and walked fresh further as if he were not a human being but a cliff goat. A few meters higher up they sat down, in order not to leave the priest too far behind. Nice attention. Right away they began to ask him a series of questions. The priest remained quiet. He neither had the breath, not the courage to answer them. If he was pleased with the voyage ( which ,God make it better, had lasted twelve hours); if the treatment during the voyage had been good ( while the man could not even remember the least what looked like a treatment while during the last twenty hours he had not had anything in his stomach with only a few draughts of water from his own field glass); if the landing with such high seas had not been excellently carried out, (whereby the mate had lost one of the oars and his hat, the captain looking around cautiously and the young cabin boy in vain did his best with the palms of his hands to stop a leak, where the water streamed through, while he himself was baptized in foaming sea water); finally if he was not tired, as Saba rose rather high. The last question suddenly frightened him into realizing that there was a still a long road ahead. He had caught his breath and come to his senses and as only answer to the friendly questions he asked: How far are we still from The Bottom. Just a small distance, Reverend. There comes the horse of Father Mulder already: let us climb a bit more, than that faithful mare will help you further. Look (he saw nothing) she is energetic and strong and will take you home safely. Indeed after several minutes climbing – strolling the Sabans called this! – Under a tree which spread its branches broadly, over the road and the chasm, he saw a horse and a man. The latter welcomed the priest and asked him to climb on the horse. Imagine! On horse up that steepness? If you tell that to your family later on they will tell you that you are bragging. Only a circus rider can do that. And going down the mountain is even worse. But regardless, circus or no circus, it must be done. And then those horses have the unpleasant custom to shave your legs alongside the rocks or on the side of the chasm to walk right on the edge, so that each moment you think to yourself: Here we go! Just after that you get a heavy scratch on your face from a long thorn branch, which you had not seen. In the meantime the gentleman who had brought the horse, walked behind you with encouraging words; do not be afraid venerable; nothing will happen; there is absolutely no danger, the horse knows the road. Church in Hell’s Gate built 1907. Father Mulder to the left. And, indeed to his great amazement, the priest after some time, that he had arrived safe and sound at the first village of Saba, flaunted with the grandiose name Leverock’s Town, but still called by the people The Bottom. What a bliss to have once again solid and flat ground under ones feet, to enter a hospitable home, where a meal was already prepared, where a friend and confrere welcomed you heartily. You see each other so seldom and a visit is means a lot to you in your lonely and monotonous existence. After an hour the tiredness was forgotten and the mood much improved. Tell news; Much news! The priest of St. Maarten was a world citizen compared to the hermit of Saba. On a certain moment Father Onderwater asked his confrere, how it stood with the finances of his two churches. Finances he asked, while looking searchingly to the ceiling. What is that again? For years already I have not used that word. My collections during Sunday Mass are about ten or twelve cents. There is a fee for use of the benches, but nobody pays that. With that my words such as finances and positive balance scratched from the dictionary. Certainly, continued Father Mulder, from the outside my churches look very nice, but having said that, that is everything to it. From the inside not even one board is in good shape. Everything has been eaten up and out by weather, wind and woodlice. And my large church in the Windward Side is even in worse condition. There the stench of the rotten boards slam into you as you enter the door. I had to remove the church bell which is something small anyhow from the ceiling posts because the whole thing is so rotten, that on a bad day the roof and the bell would fall on my head. But is there nothing which can be done to remedy the situation, ventured father Onderwater to remark? Man, stop asking about helping. When I came here seven years ago as priest, the two churches were already in bad shape. Since then I have by my own self had to tinker and bungle what I could. Mgr. van Ewijk is just as broke as I am. Thus he cannot help me himself. But now the situation cannot go on any longer. It is simply too life threatening to keep Mass in my churches any longer. Something has to be done. But how! With concern father Mulder looked his confrere in the eyes while puffing on his pipe. The latter looked thoughtfully for some time in front of him. Then he looked quickly and with a blaze of hope in his eyes to the drifting smoke from father Mulders pipe and said: I have it. I know what I will do. I have not been Editor of the Amigoe for nothing. I will dig up my pen and make an appeal to the generosity of the Dutch Catholics. They have never left the Curacao mission in need of help. Some detailed letters in “De Rozenkrans” will do miracles. Take heed of my words. That evening they continued talking for a long time. During the days following father Onderwater visited both “cathedrals” of Saba and kept his word. In “De Rozenkrans” of 1889 he published three interesting letter, respectively on page 218, 251 and 344. The results were that at the end of the same year at the Editorial Office of aforementioned monthly magazine an amount of f.1392.99 had been sent in as gifts for the poor churches of Saba. In the year 1890 page 345 there appeared a letter of thanks from father Laurentius Mulder the hermit of Saba, signed by Father Guala Wolsky later signed in a very nice article as “The Man on the Rock”, to express his joy and thanks to the Editorial staff of “De Rozenkrans” for their sympathetic intervention and to the Catholics of Holland for their generous help. Father Mulder remained living on Saba at the church in Hell’s Gate and was taken care of by the residents of that village. When he died he was buried next to the Roman Catholic Church in the Windward Side. From the book “Onze Bovenwindse Eilanden by M.D. Latour O.P. 1951 and translated by Will Johnson. 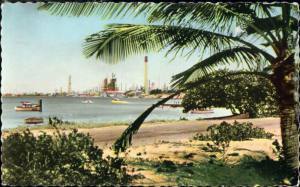 A nice view of LAGO when it was operated by ESSO.